Our marigold silk flowers are 2 inch wide. They come in bags of 25 pieces each, very high quality. You can attach them to any flower bouquet or kissing ball, adding your personal touch. Marigolds are symbolic of passion and creativity. Marigolds are also known as the-Herb of the Sun. 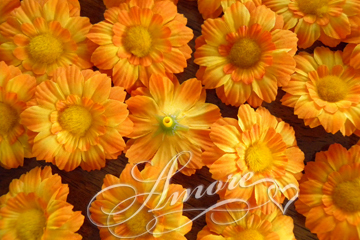 Marigolds have been used as love charms and incorporated into wedding garlands. YOU WILL RECEIVE 25 FLOWERS (heads).